This May, I will graduate from the North Bennet Street School with a certificate in Bookbinding. 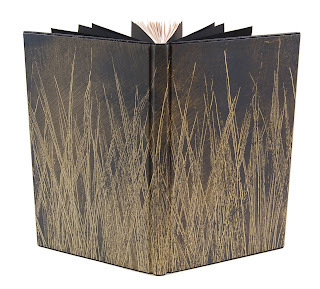 During the course of this unique two year program, students learn a wide variety of both modern and historical book structures, fine binding techniques, and book and paper repair methods. Many students go on to work as technicians in book and paper conservation labs. As graduation draws near, I've begun to worry about finding a job. Many libraries and museums have been hard hit by the recent economic turmoil, and finding a job in the field has become ultra-competitive. In order to set myself apart from the pack, I decided to create a website to show off my portfolio. I decided to use my name as my domain name (www.bexxcaswell.com), so that potential employers or private clients could find me easily. My html skills are limited, but I wanted to make the site professional. I decided to use a service called Homestead, allows its users to upload text and pictures into a customizable template. This solution was cost effective, and allowed me to create my beginnings of my website in only a few days. I'm still in the process of photographing my work and fleshing out my portfolio, but a good portion of my student work, as well as my full resume, can now viewed online at www.bexxcaswell.com!